We like to say that the Books for Walls Project was "created to support literacy, libraries and book love." But if you want to get technical we could shorten that to simply "created to support libraries." Because you see, libraries support literacy and book love. So if we support libraries, they do the rest. April 10-16, 2011 is National Library Week, which is, according to the American Library Association, "a time to celebrate the contributions of our nation's libraries and librarians and to promote library use and support." So how can a person best support libraries? Really it is simple. Janette Grice, Director of Interlochen Public Library, said it best, "use your library!" To learn more about IPL read our interview with Janette. At the Books for Walls Project everyday is National Library Week. We never have ads trying to sell books; rather than buying a book we suggest you first try to find it at the library. Need a little help? Try starting with www.worldcat.org which helps you find a book at a library nearest you, wherever you are! Interested in the State of America's Libraries? Read the 2011 report, hot off the presses --read on, click here. Follow the Books for Walls Project, we promise to keep up to date on library news and have a bunch of bookish fun. Click here for ways to keep in touch. Tell us a a Library Love Story, we LOVE stories or tell us why you love your library (we shared out top ten) click here and read more! The Sisters at Books for Walls Project sent you! Thank you, as always, for visiting our site. It's a pleasure to have you! Such great library advocates. Thanks @yourlibrary The Four of Us are happy to have you visit too! And thanks for the compliment!! @yourlibrary.org and the American Library Association can count on The Books for Walls Project for continued support! 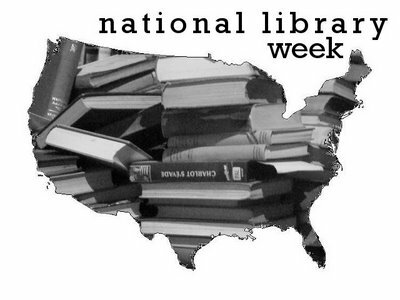 Hope National Library Week was wonderful!